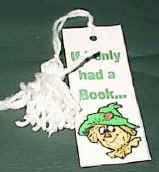 Print these "home-made" bookmarks for a special reading companion or for a great Christmas gift. Even if you have a colour printer, you may prefer the black and white version which the kids can colour in themselves.. Optional: cover with clear contact paper so it lasts longer (you could also put a piece of cardboard in the center before gluing for a sturdier bookmark). wrap wool loosely around 4 fingers 10 to 20 times. tightly tie a long piece of wool around the bottom of the circle of wool. Trim the top end of the loop. put the end of the long piece through the hole in the top of the bookmark so the tassel dangles as much as you like. Tie the long piece on and trim the end.